JBL offers the JBL OnBeat Rumble Bluetooth Speaker with Lightning Connector for $114.99 with free two-day shipping. Today’s deal is $275 off the original MSRP, down $5 from our previous mention and the best price available. 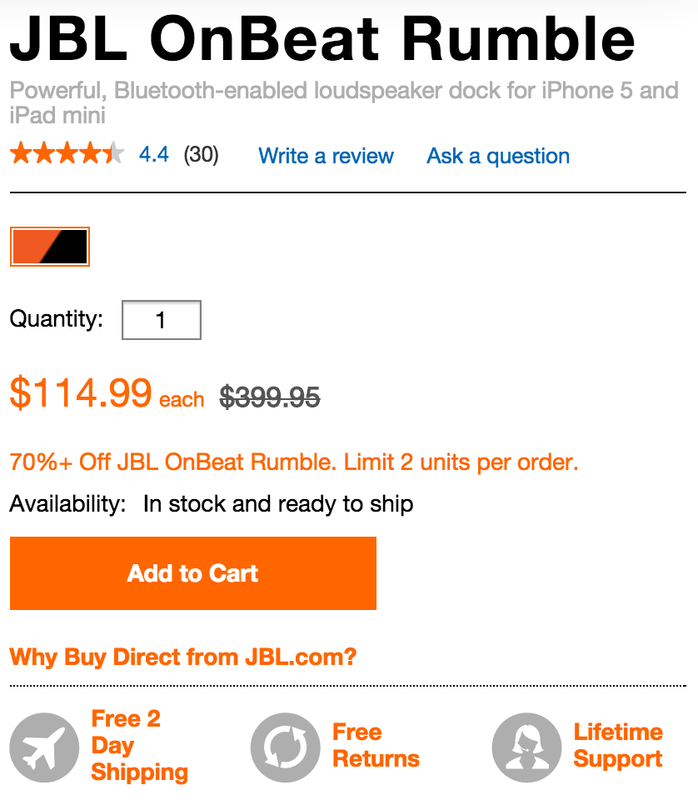 The JBL OnBeat Rumble features Bluetooth connectivity, a Lightning connector for use with compatible Apple products, 50W of power and a down-firing subwoofer. This is an excellent combination speaker and dock for your kitchen, garage or outdoor space. Rated 4.7/5 stars. The JBL OnBeat Rumble speaker dock is Bluetooth-enabled (with HARMAN TrueStream connection technology), and its built-in subwoofer delivers massive JBL sound with roaring bass from your portable players. Whether your device is docked on its Lightning connector or streaming wirelessly, you’ll get thunderous sound when listening to music, watching videos, playing games or doing FaceTime video calling with friends.